On July 29, 1968, Jeff Beck, along with a kick-around vocalist, a future Rolling Stone, and a drummer with a lot of bash released Truth. The album was a miracle of fury and berserk beauty, a testament to the jaw-dropping chops of a 24- year old guitarist who, over the course of 10 tracks and around 40 minutes, ran the gamut from electric blues and modified R&B to psychedelically influenced rock, classical, and even a little heavy-metal instrumentalism. With Truth, released just months before Led Zeppelin’s debut – and with songs and personnel in common – Jeff Beck, singer Rod Stewart, bassist Ronnie Wood, and drummer Mickey Waller (the core band) made an album that would become every guitar player’s bible and every hard rock band’s Holy Grail. With the release of Jimi Hendrix’s Electric Ladyland, Cream’s Wheels Of Fire, Free’s Tons Of Sobs, the Stones’ Beggars Banquet and The Beatles’ seminal White Album, 1968 was a watershed year for rock music. Britain was a fertile stomping ground for players seeking like-minded musicians. Electric rock was in its infancy, and people were willing to embrace the daring and the different. With Beck having established himself as a guitar player of the first degree on a quartet of bold and wickedly wonderful Yardbirds albums in 1965 and 1966 (For Your Love, Having A Rave Up With The Yardbirds, The Yardbirds [Roger The Engineer] and Over Under Sideways Down), producer/manager Mickie Most, thinking to capitalise on the guitarist’s visibility, conceived the notion of turning Beck into a pop crooner. All but forgetting that Beck was first and foremost an instrumentalist, Most shackled him with a series of less-than-guitar-focused songs. In fact it turned Jeff into a Top Of The Pops insta-celeb. But you can’t deny the producer’s instincts: Beck’s ditties Hi Ho Silver Lining and Tallyman bounced up the UK chart to No.14 and No.30 respectively in mid-1967. In 1968 Beck recorded another Most selection, an instrumental version of the ballad Love Is Blue. But by now he’d had enough. Even while preparing to record that single, he had already been making moves towards forming his own group, like two other ex-Yardbirds guitarists. Cream, with Eric Clapton, were only a year away from extinction; Jimmy Page was commandeering his own juggernaut; Beck was determined not to be left out of the race. “I always kept my fingers on players,” Beck commented in the 70s. “Every musician around London always knew what the other one was doing. All groups used to come and see each other play, and it was really nice. There seemed to be a purpose. It was like a competition: ‘They’re doing that in their act, so we’ll have to cut that out’. It was great fun; nice, hot competition. I really liked the scene then. “I had to round up a singer,” he continued. “I couldn’t think of who to get. I always liked Rod [Stewart], I dug him, with the teased hair and all the rest of it. His hair wasn’t like it is now, it was kind of curled under at the back. It was just like a piece of molded fibreglass; it looked like he’d put a helmet on, it looked so bad. And I said: ‘Rod, please, get rid of that hairstyle!’. After the relative ease of getting the first two band members, finding a drummer was a nightmare. Beck went through Ray Cook, his former bandmate in The Tridents, the Pretty Things’ Viv Prince, ex-John Mayall drummer Mickey Waller (we’ll come back to him), Rod Coombes (later of The Strawbs), and another former Mayall graduate, Aynsley Dunbar. Although the last namedheld real promise, it resulted in yet another drum debacle. “I played with Jeff for four months,” Dunbar told me years ago. “I led his band in the end, that’s what happened. I was also looking after Jeff as far as that was concerned. So I felt, seeing as I’m doing that, I might as well be running my own band and making some cash, because we were on a paid wage routine with him. With drummer Mickey Waller re-hired, and after several months of gigs, the quartet went into Abbey Road Studios on May 14, 1968, to begin recording an album. Mickie Most gave the green light to the recording sessions, although he had little, if any, faith in the band coming up with an album of any real merit (read: commercial potential), and he tended to avoid the sessions. With that dubious stamp of approval, the band set to work. “It was one of the first independent sessions that was allowed in Abbey Road,” recalled Truth engineer and in-house resident Ken Scott, who was already a veteran of many of The Beatles’ albums. The material the group recorded was a combination of the live set, reworkings and some odds and ends. The album opens with a devastating slow version of the Yardbirds’ hit Shapes Of Things, with Beck turning in a virtuoso performance. Let Me Love You was part of the stage set and one of the few self-written pieces, setting up the call-and-response sequence between guitar and voice that Beck and Stewart had perfected live. Morning Dew, another song from the touring circuit, is a pulsating interpretation of Tim Rose’s classic, and it’s given a dirge-like solemnity from Beck’s breathtaking mastery of the wah-wah pedal. Here (and on closer I Ain’t Superstitious), Beck demonstrates amazing prowess with the then-new effects pedal. Then there is the great catastrophe of You Shook Me, the old blues chestnut written by Willie Dixon and originally recorded by Muddy Waters. The song was on Truth, and was then re-fashioned by Led Zeppelin for their debut album some months later. Rod Stewart has said that on more than one occasion Jimmy Page and Robert Plant would be in attendance at a Jeff Beck Group concert, and that this is where they stole the idea for the song. Whether Stewart’s claim is weighted with no small amount of professional jealousy is open to question. Jimmy Page, however, has his own explanation for why the Jeff Beck Group’s You Shook Me and Zeppelin’s version appear to have the same DNA. According to the sleevenotes on Truth, written by Beck himself, he talks about “smashing your guts for 2:28” at the song’s finale. Indeed he did some smashing, of guitars, in those days. Ol’ Man River, the Oscar Hammerstein II/Jerome Kern standard is an odd little creature. With Beck on bass, John Paul Jones on Hammond organ, and tympani by ‘You Know Who’ – actually Keith Moon – it is one of the album’s lesser moments. But it did prompt Truth engineer Ken Scott to recall The Who’s drummer living up to his ‘Loon’ nickname. Rock My Plimsoul is a track Beck recorded back during his Mickie Most/solo career period. That staggered little drum lick from Aynsley Dunbar (who is uncredited) sets the song in motion, and provides a rhythmic trampoline on which Beck’s guitar jumps and twirls. Here, the sense of what the Jeff Beck Group may have sounded like with Dunbar on drums comes to mind. And then there is the timeless and epic instrumental Beck’s Bolero. Recorded in May 1966, this rendition of Ravel’s famous Bolero was the B-side of Hi Ho Silver Lining and was meant to serve as the launching pad for Beck’s idealised supergroup. Players include Jimmy Page on electric 12-string, Keith Moon on drums, John Paul Jones on bass, and Nicky Hopkins on piano. If Beck and Page toss dazed and confused looks at one another trying to explain why they recorded the same track on their debut records, when it comes to unravelling the mystery of who wrote this monster instrumetal, total amnesia sets in. With the album in the can, producer Mickie Most talked to Columbia about a release date. Not only did they not have a date in sight, they were reluctant to even assign one. Here Beck was, sitting on an album that could launch his band as the next Cream or pre-empt Zeppelin, and he was exiled to a hellish limbo. Ultimately, Peter Grant intervened and set about undoing Mickie’s mistakes. Grant’s first move was to fly the group to the US to play some dates – a typically bold and incisive decision. It paid off. American audiences were astonished by what they saw and heard on those trailblazing Jeff Beck Group shows. The band had struck gold. The following day The New York Times ran a stunning review, and Grant realised that he was sitting on a gunpowder keg and the fuse had just been lit. He immediately wired the review to Epic Records, and they responded with the offer of a deal. Amazingly, given that Beck has never been a man of constant… well, anything, he remains with the same label to this day. In fact, he is the label’s longest-serving artist. The label, desperate to capitalise on the Jeff Beck Group’s triumphant tour in the US, accelerated the initial release date of the album there. On July 29, Truth shipped out to America; Britain and Europe wouldn’t receive the album until October 4. It got to No.15 on the US chart – a true victory for an essentially unknown English rock band. In the UK the record never even charted. Almost 40 years after it was conceived, Truth still has the ability to make you long for a time when such albums were being made. How just one Jeff Beck Group gig conquered America. 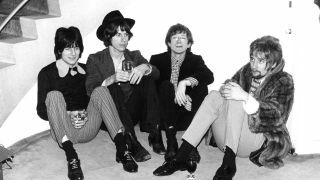 By the summer of 1968, when manager Peter Grant took the bold decision to take the Jeff Beck Group on their maiden voyage across the Atlantic, America had not yet succumbed to the machinations of the media – radio, television, print – and entire careers were being kick-started by a single performance, a one-nighter at a local club. Word of mouth was a valuable currency, and Grant was certain the Jeff Beck Group, even though they were unknown, could cash in. Where their British record label had embraced the band in less than passionate fashion – had registered only mildly Beck’s stunning and flawless guitar work, and Rod Stewart’s astonishing, blues-bruised vocals – the Americans welcomed them to their collective bosom. They treated them like conquering heroes, like melodic messiahs, like the greatest rock’n’roll band they’d ever heard. On the nights of June 14 and 15, at the hallowed Fillmore East in New York, Jeff Beck crossed the threshold and went from being a good guitarist to being a great guitarist. On that opening date, the Jeff Beck Group had been pencilled in as headliners (the Seventh Sons opened), but a last-minute promoter panic resulted in the Grateful Dead booked to close the show. They needn’t have bothered. Here, the group found its identity, its character. Stewart stopped retreating behind the wall of amplifiers and began to focus on controlling the audience, manipulating the microphone and its stand in a synchronised dance which would eventually become his signature. Beck was strangling his Gibson Les Paul and coercing sounds out of it that US audiences had never experienced before. With that single performance, Beck was immortalised. The mythology was truly being etched – finally. The Who and Jimi Hendrix had their Monterey; Alvin Lee had his Woodstock; The Beatles had their Ed Sullivan Show – signature nights; crucial moments; seminal performances. Now, Jeff Beck had his Fillmore. And Peter Grant was fuelled more than ever with the mandate of launching his young virtuoso’s career, building Jeff a bridge over any troubled waters, a safe passageway to the other side. A stairway to heaven… or at least to a record deal. What happened next to the JBG? Jeff Beck: In 1969, Beck recorded Beck-Ola, the second and final album with Rod Stewart and Ronnie Wood. Nicky Hopkins was now a permanent member. He moved on to his R&B period with the JBGII and a pair of albums titled Rough And Ready (1971) and Jeff Beck Group (1972). A studio album (1973) with ex-Vanilla Fudge rhythm section Tim Bogert and Carmine Appice called Beck, Bogert & Appice and a Japan-only live album release followed. In 1975, Jeff entered the instrumental phase of his career with the wondrous Blow By Blow, followed by 1976’s Wired and 1977’s Jeff Beck With The Jan Hammer Group – Live! There And Back , the shaky vocal/instrumental Flash , and Guitar Shop  formed the next group of releases. In 1992, Epic released the three-CD Beckology set. Jeff continues to record mainly guitar records to this day. Ronnie Wood: Appeared on Beck-Ola and then quit to join The Faces with Rod Stewart. He began recording solo albums in 1974 starting with I’ve Got My Own Album To Do, Now Look (1975), Mahoney’s Last Stand (1976), and Gimme Some Neck (1979). He officially joined the Rolling Stones in 1976 and continues to record the odd solo album. Rod Stewart: Sang on Beck-Ola and simultaneously pursued a solo career while joining The Faces with bass buddy Ron Wood. Recorded Rod Stewart (1969), Gasoline Alley (1970), Every Picture Tells A Story (1971) and Never A Dull Moment (1972) as a solo artist. As a member of The Faces, he recorded First Step (1970), Long Player (1971), A Nod’s As Good As A Wink… To A Blind Horse (1972), and the swan song, Ooh La La (1973). Became solo superstar; currently sells crooning compilations to grannies. Nicky Hopkins: One of the most in-demand session men of the 1960s, Hopkins played with everyone from The Beatles, The Kinks and the Stones to Quicksilver Messenger Service, Jefferson Airplane and on his own solo albums. He died in 1994. Mickey Waller: Played with many bands including Georgie Fame, Charlie Watts’ Rocket 88, recorded with Paul McCartney in the noughts, but died in 2008.